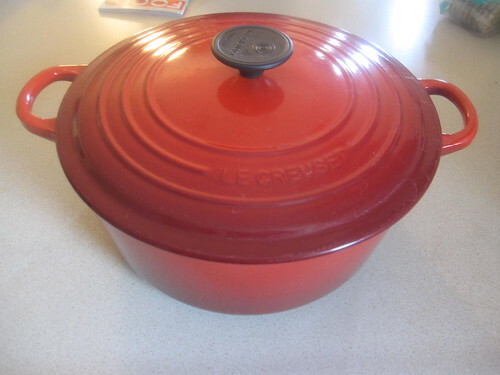 Above, you’ll see a picture of a Le Creuset 5 1/2 quart enameled cast iron pot. I picked it up at a cookware sale about a year and a half ago at roughly half off the list price. Yes, I paid around $150 for this single pot. Since then, it’s almost the only pot or pan or skillet I’ve used in my kitchen. I’ve fried eggs in it. I’ve made casseroles in it. I’ve cooked spaghetti in it. I’ve made soup in it. I’ve baked casseroles in it. I’ve made bread in it. After eighteen months of use, you can’t tell I’ve done anything with it. There are no scratches or marks. There’s almost no indication I’ve ever cooked anything on the inside of it. I’ve had skillets and other cookware completely lose their finish over a similar number of uses. I’ve seen giant bundles of pots and pans that would take up two kitchen cupboards that essentially add up to the same set of uses that this single pot has. In short, this was the single best purchase I may have ever made for my kitchen. With just this, my stand mixer, a single good chef’s knife, and perhaps another item or two (like a colander), I can cook almost anything I can think of. So what happened? I used those pots and pans and other materials. Over time, I read quite a lot of material on cooking on websites, in books I checked out from the library, and from food magazines. I also used my own experience as a guide, noting that it was harder to motivate myself to cook if I would up with a sink full of dishes. Gradually, I began to minimize in terms of practice. I started preparing pasta meals in a single pot. I started using the knife I was most comfortable with – a chef’s knife – for almost everything, and I eventually became quite good with it. The pile of dishes in the sink got smaller. I became motivated to cook even more. Eventually, it was a sign of pride for my meal prep if I used a minimum amount of equipment to make something delicious. If I were to stock my kitchen right now, I’d probably have about a tenth of the stuff that I currently have. This experience has taught me a great deal about purchases. Because of this experience, I’ve saved a ton of money in other areas of my life without reducing the experience in any way. Here are some of the lessons I’ve learned. First, start off any new area of interest with minimal equipment. I’m teaching myself to play the piano. Once upon a time, I might have started this journey off with actually acquiring a piano, along with a mountain of books. Instead, I practice at home on an electronic keyboard using public domain sheet music and a few specific songs I’ve picked up here and there. To this point, I’m learning on this equipment just as well as I would have learned on a real piano, and I’m hundreds or perhaps thousands of dollars ahead. Second, never stop learning about this new area of interest. In my ongoing effort to get into better shape, I read a lot of books and other materials on exercise, leaner cooking, and so on. What I’ve learned is that, beyond a few key items, the equipment really doesn’t make a difference. The difference is in your head. Are you motivated to actually do it? It’s all about finding exercises and routines that you enjoy and that work for you, not about buying a never-ending flood of equipment and materials. The more I learn, the more clear it becomes that the real key to success is between my ears. Third, don’t upgrade until you actually understand, from your own experience, why you’re upgrading. I upgraded to the Le Creuset pot above because the Teflon covering on my current pot was starting to peel. I knew that I wanted a very utilitarian pot that could handle a wide variety of dishes while still being easy to clean that didn’t have the Teflon problem (which limits the lifespan of an item). Since I was coming from a place where I understood from experience what I needed, I was able to identify the right item – an enameled cast iron pot. Finally, be patient with your purchase when you’re finally upgrading. Don’t just run to Amazon or to your local store to pick up the item you want. Be patient. You’ve invested a lot of time learning your new area of expertise, so why sacrifice that investment in a rush to purchase something new? I waited several months to pick up that Le Creuset, getting by in the meantime with the other items I had on hand. Really, in the end, it’s all about the experience. You should never dive into a new area of interest with a huge expenditure on equipment. Instead, focus on the minimum. Buy a single low-end pot and teach yourself how to cook using just that and a few implements. Get a used keyboard off of Craigslist and use some online tutorials to get yourself started learning the piano. Instead of buying a mountain of exercise equipment, go on a walk. Not only do you get the same opportunity to explore a new area in life, you’re keeping your hard-earned money firmly in your pocket. It’s all about the practice and the experience, not the equipment.